Goverlan Reach is a software-based self-hosted IT Remote Support solution. It is composed of the Goverlan Reach Operator Console (used by technicians and system administrators) and the optional Goverlan Reach Server (used to extend Goverlan Reach services). To get started, all you need is to install the Goverlan Reach Operator Console on your machine. The Goverlan Reach Operator Console can be used from Day 1 to manage users, computers, and servers on your internal network. No pre-configuration or pre-installation of client agents is required. The Goverlan Reach Server is not a required component for the Goverlan Reach Console to function. However, it allows you to extend its services. You can access your product installations at any time through the Goverlan Client Portal: my.goverlan.com. Use the Goverlan account user ID and password sent to you during the creation of your product licenses. Select the tab of the product you wish to download, either the Goverlan Console or the Goverlan Server. Click on Download this product under the Self-Service Area. The Goverlan Reach Operator Console runs on Microsoft Windows 7 ( 64-bit only)or Windows Server 2008 R2 and above. The default installation of the Goverlan console doesn’t have any external dependencies and you can start using it within minutes. For further information see the Goverlan Reach Console User Guide. The name of each license owned can be customized by an account administrator (see Renaming Licenses). How does License Distribution Work? Your Goverlan account can be configured with as many users as you need. You can create Standard Users (only used to sign-in to the software and access downloads), and Admin Users (used to manage licenses and license users). Standard users can only use licenses that have been assigned to them. Admin users are authorized to use all licenses. A license is allocated every time you sign-in to the software. If the free the license when I close the program option was OFF during sign-in, the allocated license is permanently bound to the operator login id and machine id. You must sign out from the product to release the license. If the free the license when I close the program option was ON during sign-in, the license is allocated only while the program is running. Once the program is terminated, the license is released and can be used by another operator. 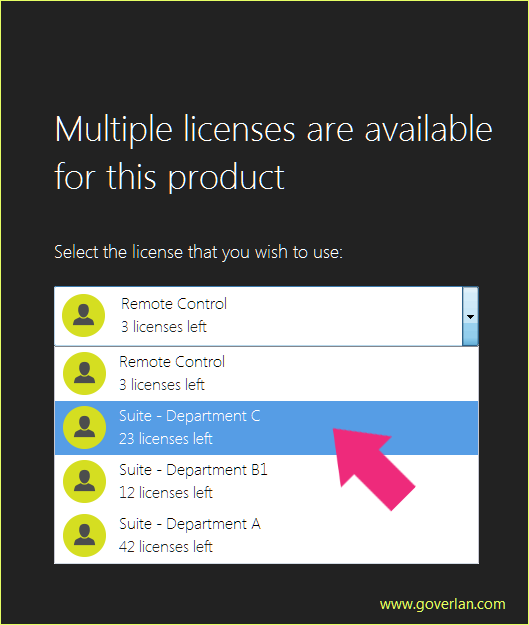 If you are using Goverlan within a Citrix or MS Terminal Services farm environment, you must select free the license when I close the program to avoid duplicates in license consumption. The Goverlan Reach Server (GRS) is an optional component used to extend the control of the Goverlan services. The Goverlan Reach Server runs on Windows Server 2008 R2 or later. 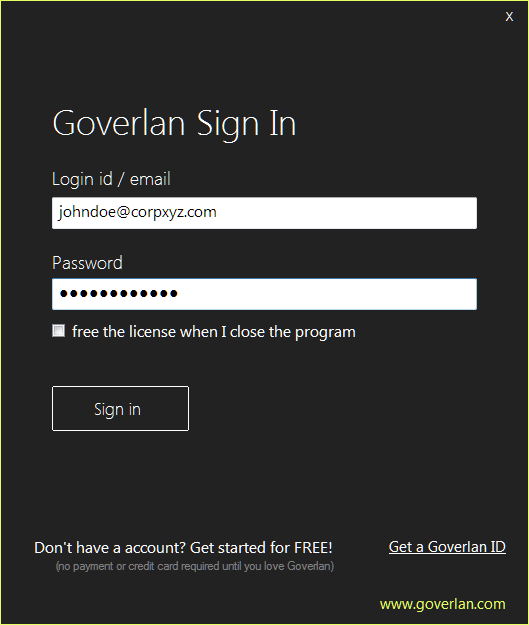 Upon the first start of the Goverlan Reach Server, you must sign-in to associate your server with a license. A server license can only be associated with a single server; however, you can create as many server licenses as you need in the Goverlan Client Portal. There is no additional fee for server licenses. For further information see the Goverlan Reach Server User Guide. The Goverlan Reach Solution is an on-premises offering and doesn’t depend on a cloud infrastructure to run. However, Goverlan licenses are distributed and managed from the cloud (for environments where internet access is restricted, we also offer an on-site license distribution service using a Goverlan Reach Server). See the My Goverlan Portal user guide for further information. The Goverlan Reach Client gives Goverlan Consoles the ability to manage any device regardless of its network location. The client agent is very small, stable and secure. It is automatically installed and managed by Goverlan on machines within your organization. Goverlan Reach has the unique ability to query the logged-in workstations of your users in real-time. Using the fastConnect technology, you can access a user’s machine by Active Directory user ID only. Goverlan automatically discovers where the user is logged-in and presents you with machine information for quick support and management. This feature may not immediately work as it requires the Goverlan Client Agents and the Goverlan Reach Server to function correctly. See Workstation Detection with fastConnect. Goverlan Reach uses a set of configurable ports to communicate with endpoints and the Goverlan Reach Server. To review the ports used by Goverlan, see Network Ports used by Goverlan Reach. Already a client that is migrating from v8 to v9? Take a look at our Goverlan v8 to v9 Migration Guide.